Today, we’re pleased to announce the public preview of Power BI Premium Multi-Geo, a new feature that helps multinational organizations address their data residency requirements. Increasingly organizations must carefully choose where to locate data to meet regulatory requirements or commitments made to their own customers. Additionally, in the case of multinational organizations, different subsidiaries, projects, or datasets must locate data in different places to meet their own unique requirements. 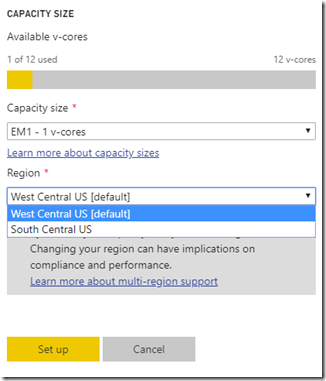 Power BI Premium Multi-Geo allows administrators to deploy a Premium capacity to one of nine geos globally available in the preview. Once deployed, customers can publish Power BI datasets to this capacity as normal. Microsoft stores the dataset and caches of query results at rest in the geo chosen for the capacity. End users will continue to have a seamless, unified experience to browse and find content through the portal at app.powerbi.com, even though individual datasets may be in various locations around the world depending on their underlying Premium capacity. At the time of the public preview rollout, your Power BI datasets and cached queries are stored in the region you select for your capacity. Additional metadata is still stored in the geo associated with your Power BI tenant, including items such as dataset credentials and Excel workbooks. As we further develop our Multi-Geo capabilities, we expect to move this metadata to Multi-Geo capacities as well. A full list of the assets that will continue to be stored in your home geo is available in the documentation. With the Multi-Geo preview, you can extend your Power BI tenant to store your users data in the geos covered in the Microsoft Trust Center, except for Power BI Germany, Power BI China operated by 21Vianet or Power BI for US Government. 1. 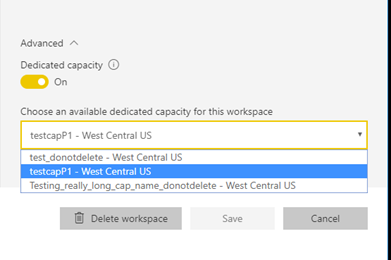 When creating a new Premium capacity for your Power BI tenant, you’ll have a new dropdown where you can select a region different from your default region, which was chosen based on your tenant country. 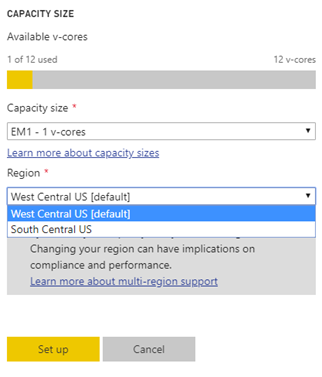 Even though you are selecting a region to deploy your capacity, Power BI may utilize other regions within the same geo to meet our commitments for high availability and disaster recovery. 2. Once created, you can easily view each region your Premium capacities have been deployed to from the Capacity settings. 3. 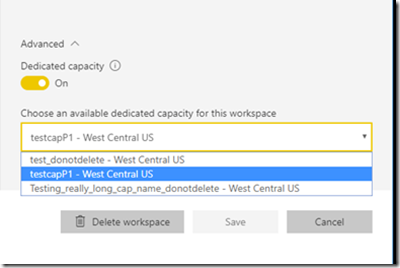 Administrators can also migrate a workspace between regions by selecting a capacity from the dropdown in the Workspace administration page. The region the capacity is deployed in is shown for each listed capacity. As we move towards GA, we’ll be continuing to enhance the Multi-Geo capabilities in Power BI Premium based on your feedback. Please feel free to leave us any questions in the comments below or in the community forums.